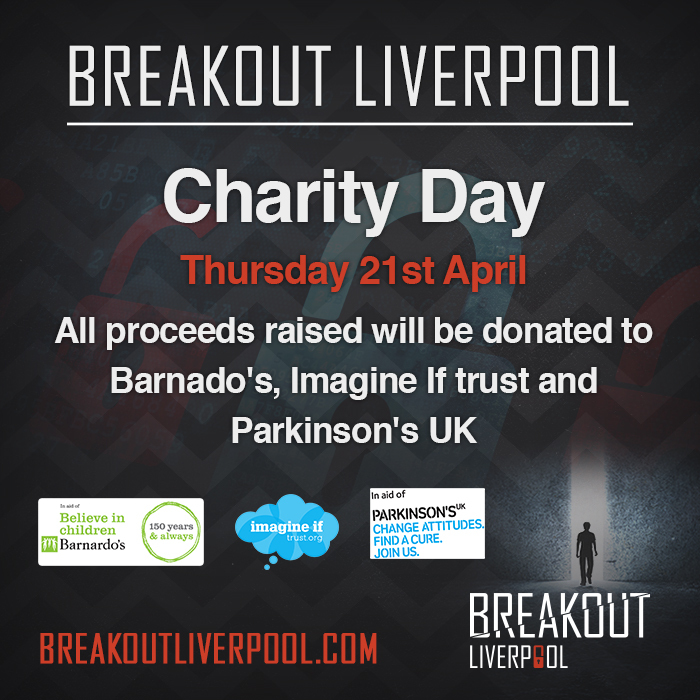 On Thursday 21st April 2016, Breakout Manchester and Liverpool are hosting a charity day which we would love you to be part of. In 2015, Breakout contacted some local charities and gave them our rooms for a day. This altered nothing from our end of the as these rooms would be running anyway, we took them off the booking system, told the charities our prices and let them book the slots themselves and take the money we would have received as a direct donation. In both Manchester and Liverpool we have worked with charities such as The Christie, Joining Jack, Parkinson’s UK, Barnardo's, Imagine If Trust and many more. For this April, we are proposing that we go national and get as many exit games involved and have a day dedicated to giving to charity. We at Breakout were wondering if you would be interested in giving some or all of your rooms to charities of your choosing on this day? Please see a link to our article on Exit Games (http://exitgames.co.uk/blog/2016/04/13/charitable-connections/) about our national charity day and if you would like to get involved please reply to this message for more information. We do hope you get involved.